The ‘It’s Showtime’ mainstay was bestowed as the Golden Jury Awardee for Excellence as Millennial Multi-media Entertainer in celebration of the award-giving body’s 50th milestone anniversary. 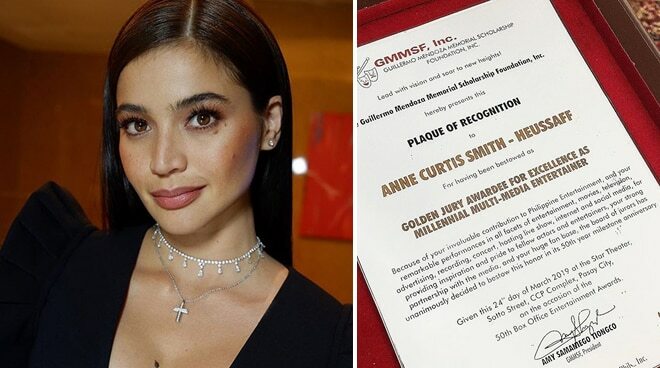 Actress and TV host Anne Curtis is over the moon to have been bestowed as the Golden Jury Awardee for Excellence as Millennial Multi-media Entertainer at the 2019 Guillermo Mendoza Awards in celebration of its 50th milestone anniversary. Fresh from her ANNEkulit concert tour in Canada, the It’s Showtime mainstay was honored at the Star Theater in Pasay City on Sunday night for her “invaluable contribution to Philippine Entertainment, and [her] remarkable performances in all facets of entertainment, movies, television, advertising, recording, concert, hosting live show, internet and social media”. Through an Instagram post early this Monday, Anne expressed her gratitude towards the Guillermo Mendoza Board of Jurors for the special tribute. “Thank you to the Board of Jurors of the Guillermo Mendoza Memorial Scholarship Foundation for this very special honour as GOLDEN JURY AWARDEE FOR EXCELLENCE AS MILLENNIAL MULTIMEDIA ENTERTAINER - that is only to be given for the celebration of 50 years of the GMMSF Box Office Awards,” she began. “People often say that a jack of all trades is a master of none but the origin of that is actually ‘a Jack of all trades is a master of none BUT oftentimes better than a master of one’. In the industry of arts and entertainment, I’d like to believe there are no boundaries at how creative and artistic you can get. Versatility can be so much fun and can bring you so much fulfillment when you continue to challenge yourself as an artist and entertainer,” she added. With this milestone, Anne hopes to inspire others to pursue their dreams no matter how impossible they seem. “I also believe, when you give your all and choose to do everything with passion, people will appreciate the hard work you do. I hope I may continue to inspire others to not be afraid to chase your dreams no matter how wild they may be. Thank you again for this recognition Guillermo Mendoza Memorial Scholarship Foundation and congratulations to all awardees last night! To God be All The Glory,” she said.